Get ready for one of the internet’s most trafficked news destinations to discuss more than “news, information & resources for the Connected Generation.” Mashable just announced its new online video series Monumental, which finds famous YouTubers and entertainment personalities debating which four items in a given category should be “immortalized” onto a digital picture of Mount Rushmore. The series is hosted by Elliott Morgan of ex-SourceFed fame. Each episode starts with eight different contenders fighting for a spot on digital Rushmore within a chosen category. Two guest panelists eliminate the first few options with Morgan, and then the panelists each have 10 seconds to argue why their choices should be in the final tally. The entire group chooses the fourth item together. The show will feature such esteemed traditional media stars and online video personalities as Lee Newton, Kermit the Frog, Joe Bereta, and Timothy DeLaGhetto. Shane Dawson and Roman Atwood make an appearance to in the premier (now live on Mashable’s YouTube channel) and debate the top four viral videos of all time. (Spoiler Alert: Sneezing Panda didn’t make the cut.). Monumental joins Mashable Minute, the other regularly-scheduled online video series in Mashable’s catalogue that also ostensibly appeals to the millennial demographic. It’s worth noting that both series are hosted by the inimitable Morgan and are produced by Collective Digital Studio (the MCN with which Mashable inked a deal in November 2013). With the introduction of Monumental, it seems the news site is continuing its quest to gain the online video attention of the kids these days with some very recognizable faces. 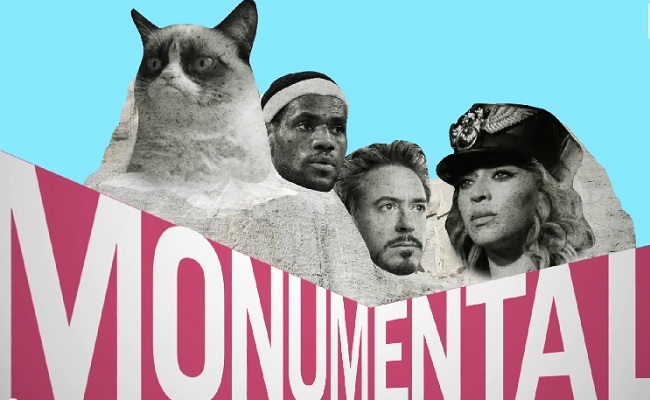 You can catch Monumental every Tuesday on Mashable.com or its YouTube channel.